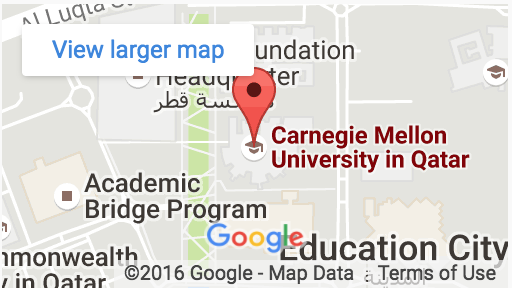 Learn more about the different areas of study at Carnegie Mellon University in Qatar. Experience CMU-Q will take place on January 19, 2019, 8:30 a.m. – 4:00 p.m. at CMU-Q. Applications are no longer being accepted. Note: Students in their final year will be given priority to be accepted. You will participate in two different program workshops: one in the morning and one in the afternoon. When you apply, select three programs and we will do our best to place you in your top two. On the night of September 22, 2012, Samer’s secretary found him lying on the floor of his office, with a rope nearby as the only piece of evidence. Skin cells found on the rope were used as a source of DNA from the crime scene. DNA analysis showed that it did not belong to the victim. Help solve the crime by using DNA fingerprinting and other biology techniques! This workshop will take you through the journey of computer scientists. You will first look at a common challenge or problem that relates to many real-world applications. You will then formalize that problem in abstract form, develop different conceptual solutions for it, and analyze the tradeoffs in these solutions. You will then take one of the solutions and bring it to life by programming a group of robots in a real-world application setting. In this workshop, you will be a trader in a traditional “open outcry” market, negotiating prices face to face within the trading pit. After the trading session, you will discuss the experience and learn how to improve your negotiation skills. You will also learn more about the Business Administration Program and the types of things you would learn studying at CMU-Q. Mission to Mars (M2M): Our New Home! You are part of an elite group of humans on the first trip to colonize Mars. 176 days into your journey, your spaceship was struck by an asteroid, damaging your information and navigation modules. You and your team of 30 crew members find yourselves in the middle of nowhere, floating in space. For the past two days, all systems are down, your databases are corrupt, and it is impossible to navigate. You are the Information Systems Director. The entire team is relying on you to salvage the information and navigation systems so the crew and can survive and succeed. Using the technology available, can you create a critically important database and navigation interface that your crew, under enormous stress, can successfully work with in order to reach your destination and succeed in your M2M? We’re all counting on you! Who can do Experience CMU-Q? Secondary school students are invited to apply. Students in their final year will be given priority to be accepted. January 19, 2019, 8:30 a.m. – 4:00 p.m. Lunch will be provided. What programs will I learn about? You will learn about two different programs during the workshop. To apply, select three programs (we offer biological sciences, business administration, computer science and information systems) and we will do our best to place you in your top two. By attending Experience CMU-Q, you become eligible to apply for Early Decision for enrollment in fall 2019. Students who successfully complete the workshop will receive a certificate. More questions about Experience CMU-Q?